I had the best show of my career earlier this month in an out of state show. Thatâ€™s a lot of pot wrapping and customer service. This show has been on the rise for me for many decades this is not the case for all artists at the show including some clay artists so itâ€™s a muti factor deal. The Christmas show is stronger than spring as one would guess. Whatâ€™s worked for me is being consistent and giving it 110% every show. Outstanding customer service also helps. For me most if not all shows are up this past year including my local outlets. Keeping in touch with your customers needs has made this happen. I do not do a mailing list anymore or any sort of show mailers I just go to the same shows in the same spots for decades and itâ€™s really worked well for me. 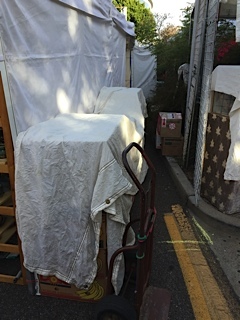 Heres the back stock in back of booth. congratulations on having a winning plan and executing it well. you deserve every penny and every compliment. So here's what I see in your set up. You don't have a theme, pretty dressed up booth, decorative accents, etc. etc. Your booth set up is utilitarian (don't get me wrong, it does look nice). 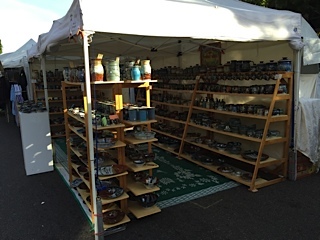 You just put out LOTS and LOTS of well made beautiful pots and the people came. Wish I could make pots that fast. Thanks for posting this information. I am still trying to ramp up my show schedule, but unfortunately will be out of the country for the main show I was hoping to add this year. I found your $26 average interesting. I try to have lots of small items, but in general I have a much higher average. Not a higher total, but folks seem to spend around $40-60. It sounds like your average sale is about 1 mug. Can you provide more detail on the range of smaller items you sell and the prices? I have added a couple more small items that I hope will sell well, but I am worried someone who might have bought a $30 bowl will just by two small $5 items instead and the profit margin on the smaller items is lower to begin with anyway. So ... Basically an overnight success story? I just want to know, whats up with the carpet man? ^^. Cushioning. Makes a huge difference on your back and legs at the end of the day. Also, it looks "homey". Booth decor and all. Cushioning is huge if you have problem feet like me! My feet used to ache at the end of every show. I bought a small, cheap rubber door mat. It's covered in little rubber bumps. I keep it right at the base of my chair where I spend the most time standing. No more achy feet! Big yes to carpets and underpads ... Stand all day on a poured concrete floor or hard sidewalk and you will suffer all night! The throw rugs are polypropylene . I have spokenen about them before as they do not hold water or dirt. They are light and roll up. You will have to run them down at a Asian market . They are sold by the meter the large ones are 3 meters like the two in the photos. I do not use my rugs at all shows but they make for a nicer display than the street and you stay cleaner restocking on your knees and they keep my bag box off any rain on street as well. They are not easy to find but well worth the effort if you do shows for a living and have an open booth concept. Shoe inserts better shoes now this tihread is going sideways about feet. Jeff as to the averages sale talk I use a small cash register at most shows and thus I can see each sale and divide them buy total money for the day or days or whatever. The total in card sales for the same 3 day show is almost 12 k with the average at 38$ so cash sales always dilute this higher number. Thanks for info on carpet. I thought it was for looks, didn't think about feet. 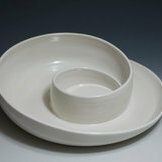 How many potters do you have working on production in your studio? The physical demands of producing that amount of pottery every year would do me in. Thanks for the further details on the small items. I am certainly not above making smaller/cheaper items to increase sales. I have been selling a lot of extruded soap dishes, thrown sponge holders (two styles), thrown small bowls (~2" thrown off the hump), and I just started making small square bowls made from slabs draped over 1/2 softball sized plaster molds (made from cutting plastic christmas ornaments in half). Looking at the time, the smaller stuff is still my lowest profitability, but it is getting better as I get faster. Mugs are also a bottleneck for me. I do not like extruded handles, so the pulling adds a bit of time. I tried raising the mug price to $25 (from $20) this year and sales dropped considerably. All other pottery vendors had nice mugs for $20. Dropping the price at the second holiday show increased mug sales by a factor of 4 or more. Midwest art pricing requires a little adjustment. I used to be a serious woodturner and found certain things would just not sell in this region, no matter the quality or price. The new Peter Pugger is helping a lot with increasing production of small items. I am working through my 700+ pounds of scrap clay backlog and the consistent 3" pug is quicker to cut into consistent weight pieces than workign with the 25# bags. 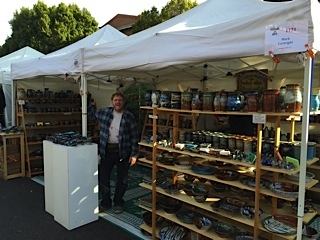 I've been to one of Mark's shows, what it looks like is lots of very well made pots, many choices of glazes, nice range of price points and very efficient cash/wrapping. The day I was there (Anacortes) it was pouring out and yet his booth still had a lineup of customers. Going to be chiming in on this topic..next year. they are called anti-fatique mats. Mark, sounds simple, in fact you said it yourself, so must go do it!!!!!!!!!!!!!!!!! Congratulations, a result of great observation and work ethic. Are you trying to hang from that pole? In my contracting days I got to work on many of the major dept. stores around St. Louis. During that time I got to meet the big wigs and listen to the ins and outs of retail sales. Millions of dollars were spent designing the perfect store, with the perfect traffic flow, and displays specifically designed to spur impulse buying. Was rather amazed they spent millions studying colors and lighting: doing subject studies of what promoted consumer spending. Bright reds and oranges promote impulse buying according to their paid psychologists. So I think I would have one or two bright red/orange pieces high up on the shelves, in the most visible spot that stuck out like a sore thumb for those milling around. Like a big neon sign- come over here and spend your money. We are curious creatures, we will come and look even if we do not like the piece. 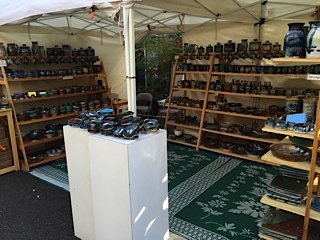 In my experience, display and merchandizing for a pottery audience is different from merchandizing for the general public. Pottery fans are very knowledgable and their priorities are deeper than "oooh shiny!" My advice to anyone who wants to sell is to disregard the impulse shoppers. Instead try to impress the educated customers and their deeper values. 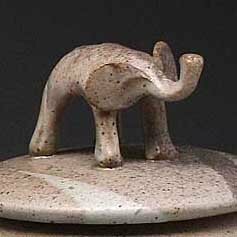 Some of the psychology of big box retail merchandizing applies to pottery display building in terms of how your eye travels over a setup, but that's about where it ends. Colour psychology is actually highly subjective, and varies widely from region to region. No one wears white at a wedding in Asia because it has a very different meaning there. And green isn't a "peaceful" colour if you have negative associations with it. Merchandizing for a 10x10 booth at a trade show is a different animal than a full time retail setup is a different animal than a 6 foot table display. I speak from experience, having built several of all of the above.
" how your eye travels over.." That was the point I was making, am aware of the differences between a booth and a box store. However, the principle remains the same. If you are competing with booth after booth, having something up high that catches their eye; draws attention to your booth. Home Depot has bright orange signs and logos for a reason: draws your attention to them. Was not suggesting a line of orange and red; just one or two to draw attention. I also buy home remodeling magazines on occasion just to see what the latest color trends are. What potters call personal aesthetics, marketing calls branding.